For the second straight day, there was not a single Win in the Twins minor league system on Monday night. Not that that has any bearing on the depth of the system. Just four or five games into the season, there are no definitive takeaways at this stage and even attempting to make any grand statements based on that small a sample is fool worthy. That said, usually these reports are more fun to watch when everything is going well, right? The Twins acquired Des Moines native and outfield prospect Malique Ziegler from the Giants in exchange for recently-DFAd first baseman Tyler Austin. The Red Wings used the power game early and late, but it wasn’t quite enough to overcome their deficit to the oldest team in Triple A. Syracuse has a lineup that features former Twins outfielder Carlos Gomez, former catcher Rene Rivera, Rajai Davis, Adeiny Hechavarria. Youngster Tim Tebow was not in the Syracuse lineup on this night. The Red Wings started big league veteran Justin Nicolino. The southpaw went the first four innings and gave up four runs on seven hits and a walk. He struck out two. Tyler Duffey came on and gave up one run on two hits and two walks over two innings. Yes, he struck out two batters. Mike Morin struck out four, and walked one, over two scoreless innings. John Andreoli got the Red Wings on the scoreboard with a two-run homer in the third inning. Down three going into the ninth inning, Brent Rooker hit a two-run homer to cut the deficit to one, but they were unable to tie the game. Rooker went 2-for-4 with his second home run. Adam Rosales and Ronald Torreyes each went 2-for-4 as well. The Blue Wahoos attempted a comeback in the ninth, but it fell just short as the winning run came to the plate. Andro Cutura made his first Double-A start. The right-hander went 3 2/3 innings. He gave up three runs (one earned) on three hits. He walked two and struck out five batters. Sam Clay came on with runners on second and third and two outs. He allowed both runners to score and three more runs before getting out of the fourth inning. He got one out in the fifth frame before being replaced by Cody Stashak. Stashak got the next five batters out, three on strikeouts. Adam Bray got the seventh inning and gave up a run on three hits and a walk. He struck out two. Ryan Mason pitched a perfect eighth inning. Mitchell Kranson got the offense started. In the second inning, his first home run of the season gave Pensacola a two-run leave. Kranson also walked twice in the game. Luis Arraez, who turns 22 on Tuesday, went 1-for-2 with three walks and drove in a run. Jordan Gore went 3-for-5 from the leadoff spot. Down four runs in the ninth inning, Caleb Hamilton connected on a two-run homer to cut the deficit in half. The team got the go-ahead, winning run to the plate but were unable to score. The big news before this game was that Dunedin was sending baseball’s top prospect Vlad Guerrero, Jr., on the bus to Ft. Myers for this four-game series. The slugging third baseman went 1-for-4 with a walk. Miracle starter Charlie Barnes got Guerrero out the first two times he faced him, but the third time, Guerrero singled in a run. Barnes gave up four runs on six hits, three walks and a hit batter over 5 1/3 innings. He struck out six batters. Anthony Vizcaya came on and threw 2 1/3 scoreless innings despite giving up a hit, walking three and hitting two batters. He struck out three. Johan Quezada struck out two of the four batters he faced and got out. The Miracle managed just five hits. Travis Blankenhorn went 1-for-3 with a walk and his first home run of the year. Ben Rortvedt was 1-for-3 with a walk. Royce Lewis had a single and stole both second and third base. The Kernels returned home after a two-game series in Wisconsin. Andrew Cabezas, the Twins Daily choice for short-season pitcher of the year in 2018, made his first start for the Kernels. He gave up only an unearned run over the first five innings. He gave up five hits, walked one and struck out four batters. Austin Schulfer came on in relief and gave up three runs on three hits and four walks over the next 1 2/3 innings. He struck out one batter. Carlos Suniaga came on and gave up five runs (four earned) on four hits and a walk over 1 2/3 innings. He struck out three. Jose Martinez came on and after walking the first two batters and allowing a sacrifice fly, he recorded the final out. 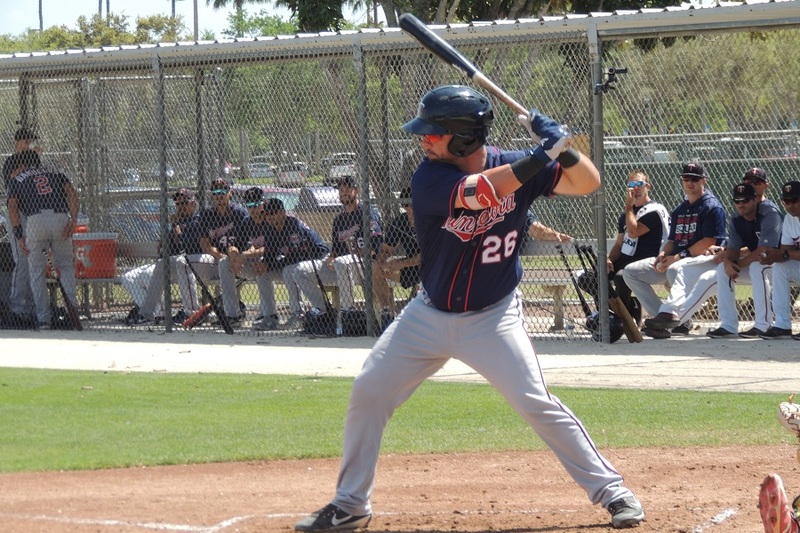 Chris Williams, the 2018 Twins Daily short-season hitter of the year, got the Kernels on the board with his first home run of the season. Later, Trey Cabbage hit a solo homer, his second blast of the year. Williams drove in a run in the eighth inning with an RBI single. Pensacola - No Game Scheduled. Trey Cabbage was a 4th round pick out of high school, and still only 21, has made clear strides offensively every year in the minors between different levels of rookie and A level ball. He's off to a blazing start this year, 6-13 with 2 HRs in 3 games, and with this being the third year he's spent time in Cedar Rapids, any idea when he might get the call to Fort Myers? The bats have been a bit slow coming out of the gate, to say the least. Gordon, Javier, and Kirilloff being out makes it seem worse, I suppose. Rooker now with 9 K’s in 16 PA at Rochester (after posting 12 K’s in 23 PA in spring training). But there’s no question the results are fantastic when he happens to swing where the ball is. It'sbeen 3 games... Unless there is some sort of injury at Ft. Myers, I can't imagine calling him (or anyone) up within the first month. Of course, the Wander Javier situation could be a factor in that... and there always seems tobe an injury or something. But making anything out of 3-5 games is too quick. That said, Cabbage likely wanted and needed to get off to a fast start, and he has. Third year in Cedar Rapids just feels a little deceptive... He spent maybe 6 weeks in Cedar Rapids in 2017 and all of 2018... So I don't think there needs to be a rush. Well, and worrying about his spring training MLB numbers is just part of the story. He didn't play a ton for the Twins and sometimes it was just one late at bat. And also, he played in a whole bunch of minor league games in spring training too. I don't know what his stat line was or his K% but we all know he's a strikeout guy. I'm shocked to see the Pitchers struggling early. A little defense from Brent Rooker last night as well. And here's John Andreoli's opposite field homer. The most surprising point to me this morning, Seth, was your comment that Arraez turns 22 today.It seems that he has been having multi-hit games forever and even after missing most of two years ago still is that young.May be more of a prospect than we think, and I think he is a future major leaguer.Interesting to see how Mobile kept him from having another multi-hit game...walk him 3 times. But perhaps even more surprising is what the heck is Guerro doing playing A ball?Is it merely a holding period until his 17 games or over?Or is he on some type of rehab from a spring injury? Looking forward to see how Stewart and Rijo throw the ball tonight. Over time I have become a Cabbage Skeptic.There has been so, so much swing and miss to his game that I am doubting he makes it past High A.He needs to worry less about power and just contact the ball.If you don't put the ball in play you are an automatic out. He has already been passed by players younger than him drafted a year later than he was (i.e Miranda, Rortvedt, and Baddo) to name a few, Maybe he will be a late bloomer but IMO this is a make or break year for him.If he doesn't show improvement in his K rate his chances of making it are razor thin.I am glad he is off to a good start, but he needs to keep this up to move up IMO. I agree with most of this. I was hoping he'd break out a while ago but he's really struggling. The one potential thing to remember is that he is a switch hitter and it might take a switch hitter longer to develop, esp since Cabbage didn't come from a baseball hot-bed and didn't play it all year round. He might be like Nico Goodrum who just needed 2000+ minor league at-bats before we know who he is. Cabbage has less than 800 so far. We attended the Miracles vs Dunedin game last nite and here are a couple of take-aways from the game. 1.Royce Lewis is going to be fun to watch. 2. Vladamir Guererro Jr. is huge and slow but the man can HIT! Watching him play 3B will be interesting. 3. Johan Quezada is in his sixth season of pro ball but is only 24. The man is 6'9" tall and last night he was consistently between 95-97 and topped out at 99. He deserves to be in a higher league. Guerrero injured his oblique about 3 weeks before the season was to start. Last night was his first rehab game, and he's expected to play all four games in Ft. Myers. Agree with the Goodrum comment. Might just take a little longer. Also agree that the swing-and-miss is what he needs to work on. But there's a fine line... don't' want him to be a slap hitter either. Just have to find that right middle ground. Also, Cabbage is solely a left-handed hitter, not a switch-hitter. Oops, my bad. I was sure he was a switch hitter. I'm a little concerned about having Rortvedt & Jeffers both in Ft. Myers at the same time. would like to see them both doing full time catching and not splitting time with each other behind the plate. I wonder if either will be a candidate for an early call up to AA? How long is Kirilloff going to be out? Really want to see him hit at AA and see if he can stay on that fast track. Glad to see Rooker showing some skill in the OF. Positional flexibility may be important for him. I'm not worrying about his K rate...yet. But hopefully he gets more selective at the plate and has better contact, because the power is absolutely for real. Why is Raley playing CF and DH? Is Wade not a better CF candidate than Raley? And is Andreoli really going to be the primary CF? Because I'd like to see all of Wade, Raley, Rooker and Weil starting and playing the field most days. Also, Cody Stashak = future Twins multi inning bullpen ace who too many people slept on. A year from now 29 other teams are going to look at each other and say "I can't believe we didn't grab him in the Rule V!" 3.) I mean, with his 1 1/3 innings pitched last night, he now has thrown 12 total innings above rookie ball. Pitched just 9 2/3 innings last year for Cedar Rapids. Has had so many shoulder issues, but he's a very intriguing prospect. They need to be patient with him and let him get some innings, but he should end the year in AA. (and then they should protect him on the 40-man roster). Rooker, Raley, Wade and Weil are all going to play most days, probably 4 out of 5 or more. But AAA is about having guys who can contribute in MLB. So they have to keep playing Andreoli too. If Cave were to get hurt or struggle, I would assume they would call up Andreoli because they want those other guys to play most every day. Same with a guy like Rosales. That''s what AAA is. Having guys ready to call up. Those veterans are guys that they can call up when needed, then DFA when they aren't and possibly they come back. If Rosario or Buxton or Kepler got hurt, you call up Wade because he'll presumably play almost every day. Rooker and Raley aren't on the 40, so also no reason to call them up unless they aren't going to play. That's the difference between AAA and all of the other minor leagues. Sure but if Andreoli is called up to the majors to be the 4th/5th OF, I think I'd still prefer he was the 4th OF in Rochester so the prospects could get most of the defensive reps. It's only been four games so we'll have to see how it plays out, but I'd worry that if Raley is stuck DH'ing half of the time, he's going to be pigeon-holed similarly at the majors. I'd also hope that if the Twins needed another defensively competent OF for a short term replacement, even if it's the 4th OF, that it would be Wade, not Andreoli. There are too many of these guys in Rochester right now. Even if it's sporadic, I hope they start giving them some MLB looks when they can because there will never be a scenario where there's room on the MLB roster for all of them. The clock is already ticking on figuring out the growing logjam of corner bats, they need to use any kind of injury replacement for MLB evaluations. Sorry, I can see how the original comment was misleading, but I was thinking if he can keep close to this sort of performance, hitting homers every few games, keeping the average up by .300, at what point maybe in May or June do they decide he's seen enough pitching there, because in 2017, looking at gamelogs he spent 2 months in Cedar Rapids, or would they wait until much later like August or keep him there the whole year. Vlad Jr blew up. He legitimately needs to lose 50-60 lbs. His diet will certainly contribute to injury.